FOR THE QUALITY OF YOUR LIFE: Our Glass Drinking Straws follow the popular ideology of environmental-friendly life, which strives to improve you life quality without damage the environment. These glass drinking straws are made of pure non-toxic glass which is 100% safe, whether drinking hot or cold drinks. Ideal for cocktails, smoothie, milk shake and more! PROTECT YOUR HEALTH – Plastic straws contain the dangerous chemical BPA. It can potentially cause severe diseases including: hormonal disorders, obesity, premature puberty, and even cancer. The sturdy premium Glass straws -Healthy, Reusable, Eco Friendly, BPA Free, Very Sturdy , so once you choose to buy our straws, you will reduce the use of 500 million disposable plastic straws. Do you wish to keep our planet green? The Glass Drinking Straws are right for you!
. Healthy – Compared to the toxic BPA material found in plastic straws.
. Eco-friendly – Stop non-biodegradable plastics from entering the environment.
. Easy to clean – Just rinse after use. If food gets stuck in one of them – use the included full-length brush.
. Very Sturdy – Made from the most durable borosilicate glass available on the market.
. Safe for kids,Lead free glass material. 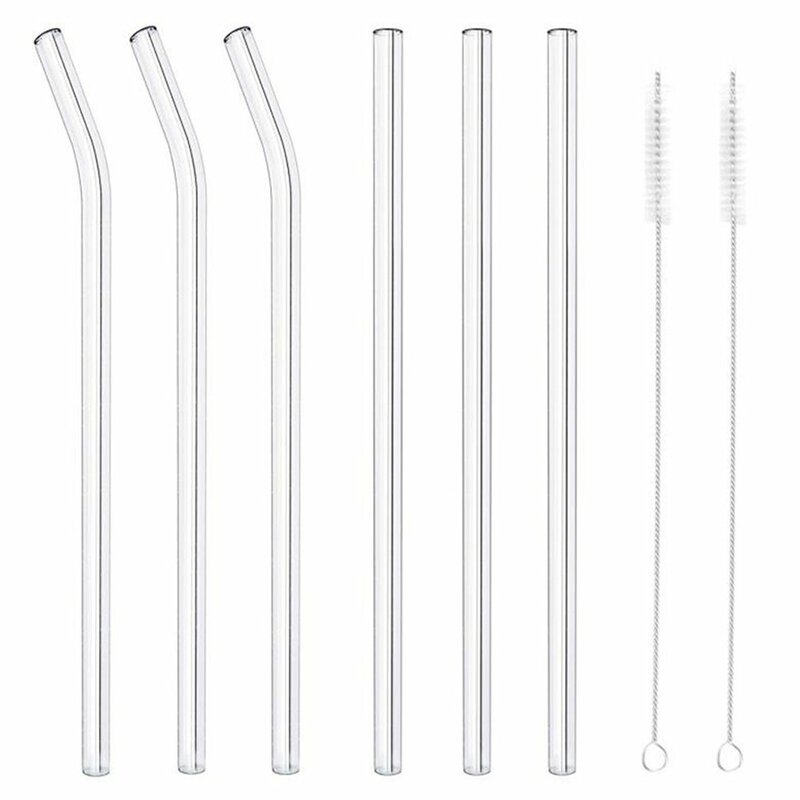 Made of food-grade Glass, Glass Drinking Straws is reusable,clean and enviramental friendly,a perfect replacement for your plastic straws. Get a set of 6 Glass Straws(3 bent+3 Straight+2 Brushes), trendy for family reunion,girl’s night out,cocktail party,perfect for on-the-go, kitchen, BBQ, picnics, party favors, boating as well all around the house, or out on the patio! Dishwasher safe, scratch-free and stain-free;comes with 2 flexible cleaning brushes, making cleaning as easy as it can get. If you are not 100% happy with your straws, send them back for a full refund! MORE CHOICES FOR YOU: This 6 set comes Aproximately 8.5 in /21.5cm long from top to bottom. diameter 0.3 in/ 10mm, (3 bend 3 straight and 2 free cleaning brushes). EASY TO CLEAN: Simply rinse the reusable cocktail straws after use or place them in the dishwasher. Two full-length cleaning brushes are included in the package for a clogging of a straw. ORDER NOW and get a 1-YEAR MONEY BACK GUARANTEE.